Backed by a team of highly experienced professionals, we are involved in manufacturing, distributing and supplying Bajaj 4S Gasket Set-Full Packing Set. Known for its precise dimensions, these gasket sets are completely checked in terms of quality for assuring its flawless range. The offered gasket sets are designed with supreme quality material and contemporary techniques. The offered gasket sets can be availed in bulk range at industry set rates. With our establishment in 2012, we, “Amigos Gasket Manufacturers” is major manufacturer, supplier and trader of superior quality Two Wheeler Gasket Kits. Our offered product ranges includes Two Wheeler Gasket Sets, Two Wheeler Clutch Packing and Bajaj Block Gasket Packing Set. These sets are very much accepted in the market for precision engineered design, high strength, excellent abrasion resistant and high temperature bearing capacity aspects. 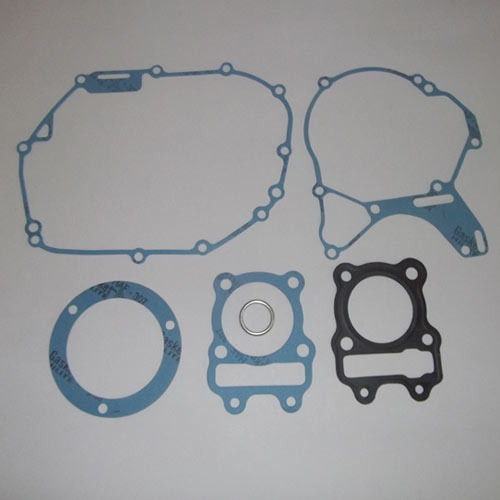 With the use of high-end technology and fine-grade raw material, these gaskets are available with us in varied specifications for serving the vast needs of customers. Moreover, with their supply in market leading rates, we have earned ourselves a respectable clientele base. With the superior aim of accomplishing diverse demands of customers, we have implemented new-age infrastructure system. This system contains high-end manufacturing, quality testing and extent warehousing facility. We make the potent use of these facilities for fabricating these gaskets by fulfilling the definite needs of customers. Moreover, we make the effective use of skilled professionals for ensuring the unobstructed flow of production. Owing to these aspects, we are major distributors of providing gaskets for two wheeler vehicles of Hero, Honda, Bajaj and TVS.